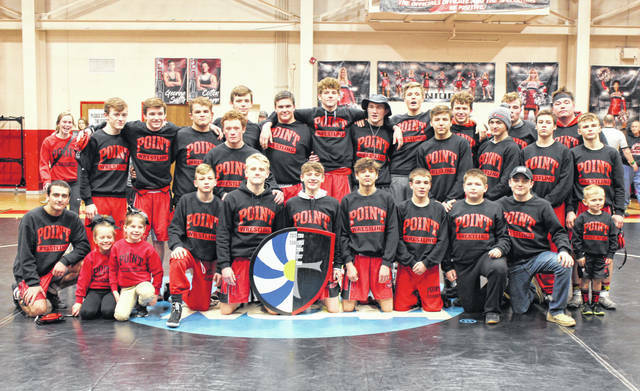 Members of the Point Pleasant wrestling team pose with the shield after defeating Ripley 55-9 on Friday in Point Pleasant, W.Va.
PPHS sophomore Nick Ball spins out of the grasp of Ripley’s Ethan Bryant, during the Friday’s ‘Battle for the Shield’ in Point Pleasant, W.Va.
POINT PLEASANT, W.Va. — The shield stays home. 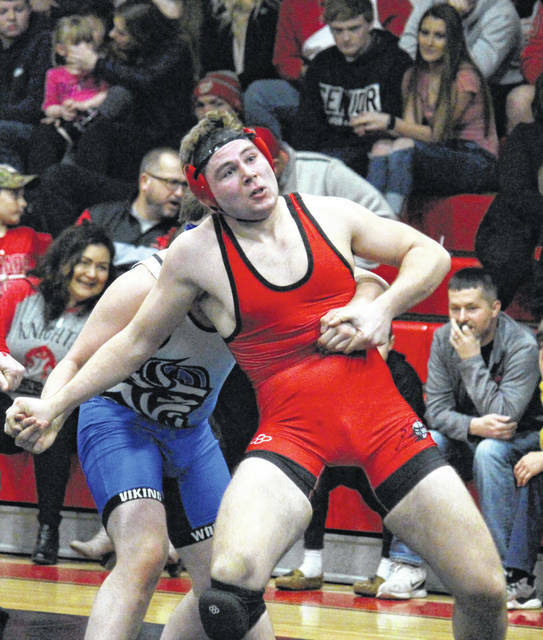 The Point Pleasant wrestling team claimed victory in the Battle for the Shield dual against archrival Ripley for a third straight season on Friday in ‘The Dungeon’, as the Big Blacks won a dozen weight classes en route to the 55-9 triumph. PPHS — which became the first team to win the shield in back-to-back seasons a year ago — is now 6-2 against the Vikings in the annual head-to-head contest, with the Big Blacks winning all-5 times that the battle has been held in Mason County. Opening the night in the 106-pound weight class, PPHS freshman MacKandle Freeman claimed an opening round pinfall victory over RHS freshman Brock Matson. Next, in the 113 class, Point Pleasant’s Isaac Short claimed a 7-0 decision over Brett Haskins. Christopher Smith was next for the hosts, and claimed a 9-2 win over Ripley’s Nate Cox in the 120-pound division. At 126 pounds, Point Pleasant’s Justin Bartee ground out a 2-1 victory over Luke Miller, stretching the Big Blacks’ lead to 15-0. PPHS senior George Smith needed just 38 seconds to earn a pinfall victory over Brandon Cobb in the 132-pound class, and then Point Pleasant sophomore Mitchell Freeman followed it up with a opening round pinfall over Evan Shouldis in the 138-pound division. At 145 pounds, Wyatt Wilson topped Eli Koontz via 10-1 decision, increasing the Big Blacks’ lead to 31-0. Ripley’s first victory of the night came in the 152 class, as Ethan Koontz pinned Point Pleasant’s Colton Carr in the second period. Next, Logan Southall got those six markers back for the hosts, winning via forfeit at 160 pounds. The Big Blacks gained another six points in the 170-pound class, as junior Nazar Abbas pinned Isaac Parsons 40 seconds into the second period. The Vikings were back in the win column in the 182-pound division, with Austin Boggess holding on for a 7-4 decision over Juan Marquez. PPHS answered again and got those three markers back in the 195-pound class, as Nick Ball picked up a 7-2 decision over Ethan Bryant. 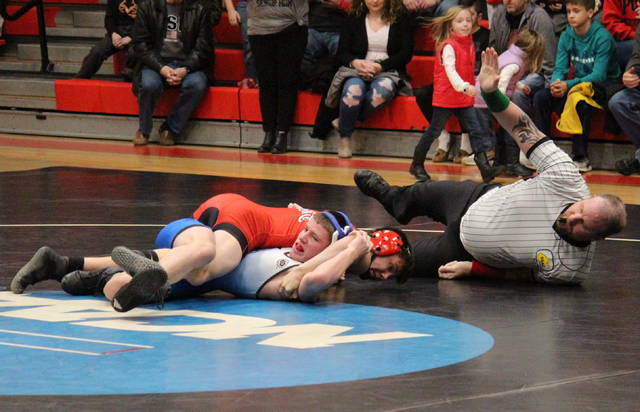 Point Pleasant junior Wyatt Stanley recorded the final pinfall of the night, defeating Tanner Ross in the second period of the 220-pound match. In the heavyweight clash, Jacob Muncy capped off Point Pleasant’s 55-9 victory with a 1-0 decision over Matthew Moore. Following the victory, 10th-year PPHS head coach John Bonecutter commended Vikings coach Matt Smith and noted that a rivalry victory is the perfect way to get ready for the postseason. The Region IV meet — Point Pleasant’s next slated event — is scheduled for Feb. 8 and 9. Coach Bonecutter also acknowledged that it was nice to see his team perform better than the last time the Big Blacks were in action. Prior to the Battle for the Shield on Friday, PPHS honored seniors George Smith and Colton Carr, both competing for the final time in a home match.